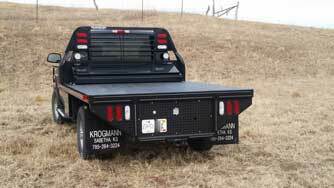 Krogmann Manufacturing announces heavy-duty constructed flatbeds for both dual wheel or single wheel pickup trucks used in farm and ranch operations, construction and commercial landscaping. 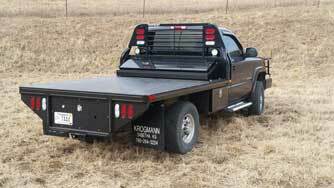 These flatbeds are built with 5" channel iron main frame and watertight, sealed beam 3" cross members. The deck plate floor is made with 1/8" steel. This unit is equipped with a recessed 30,000 lb. rated gooseneck ball for towing fifth wheel trailers. A heavy-duty receiver hitch for pulling trailers is attached to the frame. Rub rails for added protection along with stake pockets help with securing the most demanding loads. 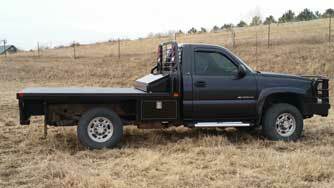 The protective headache rack offers solid protection to the truck cab. LED taillights and backup lights as well as mud flaps are also standard equipment. 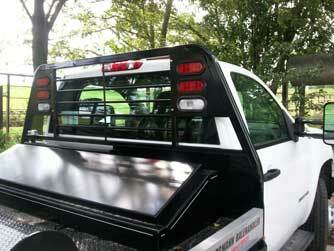 Desired options included side toolboxes, across-the-bed boxes, headache rack lights and work lights. 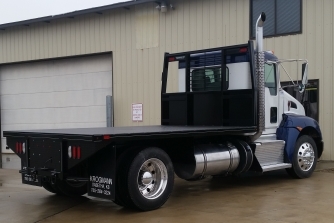 Custom flatbeds are available for shorter or longer configurations.